I have probably the worst track record in the Blog-O-Sphere for answering questions in the comments. I told myself I was going to be better about that. And then I promptly wasn’t. And now, I’m just randomly answering all the ones I remember. How awesome is that? So, item number one: The blue baby sweater. The pattern is, delightfully, a free one. Buttery Soft Baby Set, courtesy of Lion Brand yarns. To answer another question, well. Normally, yes, I’d block the pieces before I seamed them. The main reason I didn’t bother with that on this one is that I’m using ac…(c’mon, girl, you can say it…deep breath…) acrylic yarn. OK, so, silliness aside: The reason I’m using acrylic is because I’m doing this knitting for one of the charities my knitting group, Knitting 4 Children, supports. This group has been all but dead for a couple years, but lo!, in the last month or so it has sprung alive with a vengeance. Which has been wonderful, frankly. I’ve had a bunch of little sweaters all done except for running in seams and adding buttons for a long, long time now. Meant to, was gonna, etc. etc. etc., but just never actually did it. But after having been prodded, I spent some good quality time over the holidays watching anime, drinking hot beverages and finishing some things up. And then I cast this little sweater on during our knit-a-thon a couple weeks ago, honoring the group’s founder – alas, no longer with us (although I’m pretty sure she’s watching from her spot with the angels, and approving the sudden rebirth of her group). But to return to the point, it is fairly common when you’re knitting for charities that cater to newborns, especially preemies, for them to request / require no animal fibers. And occasionally, they will even request no cotton, either. The reason is simple: A lot of their tiny clients have extreme health issues…the last thing anybody needs is to find out that this poor little thing, already struggling to keep breathing, is allergic to wool and has allergy-related asthma. Or breaks out in hives all over their precious little head or something. So – this and many of the other baby articles to follow will be made with acrylic, or cotton. Both of which I have in ample supply, although the cotton is mostly natural / white and will require some dyeing before I’ll be ready to use it. Oh, DARN the luck. Completely unrelated but randomly coming back to mind for no apparent reason (from, like, last summer) – dried zucchini. This really is one of the simplest food preservation deals out there. And then, you can use them in a variety of ways. The slices in the picture I actually drenched in some vinaigrette first, and we ate them like potato chips. Untreated slices can be eaten like very chewy chips, and they and larger dices work well in soups (especially pureed ones – the texture won’t be anything like the original vegetable, but the flavor is usually good enough that you aren’t playing the “is that a chunk of potato, or zucchini?” game)…smaller dices can be tossed into a salad as-is, or rehydrated first with boiling water. And this was never a question, but should have been. Holiday cherry recipe from the book Canning for a New Generation. Ohmygah…fabulous. They’ve had a good long time for the spice flavors to deepen, and just wow. Insanely good. So are the honey-ginger apricots. This book is a real keeper, if only for adding some unusual twists to the usual suspects. I think that’s all the most pressing random items for today. Wait. I think thinking is what gets me into these messes in the first place. Never mind. That’s it. Good night, and may your God go with you. I have been accused, anonymously no less, of not being able to make a point without telling a story. This accusation is supposedly based upon my previous Outlook articles. This is totally inaccurate and I am actually offended by the accusation. And it then goes on to…tell a few stories. Because of course it does. Because, well. Y’all know how I am. I can’t even tell you what time it is without doing it in parable form somehow. Mostly that would be because I like stories personally. I like to observe things around me. I like to focus in on something tiny and commonplace and make a story out of it; I like to notice the weird things, the gloriously red-headed, the magnificently out of step. I like to make of my daily life the stuff of novels – even though in point of fact, my life is only slightly less ordinary than Everybody, and a lot more ordinary than many, many others. I like to have fun with the words, to see if I can’t paint a picture with them that recreate in the listener’s mind the thing I was seeing. Stories also can teach hard things very gently. Let’s face it, a lot of what I have to teach isn’t very fun. It’s a combination of hard work, restraint, more hard work, and how about a little extra work while we’re at it? And then, having tuned them out pretty well…I’ll proceed to the forgetting stage. What was the second part again? Wait, first you…wait, what was the first part…? OH WELL. But stories on the other hand…I like to use them when I’m trying to teach things because lessons are boring prone to being a hint on the accusatory and/or bossy side. YOU should, YOU ought to, YOU need to, YOU shouldn’t, YOU mustn’t. Stories, on the other hand, don’t generally accuse the listener of anything directly; the story may sit a little uncomfortably when it touches too close to home, granted, but at the same time…I’m not saying you should, you need to, and if you don’t, these Terrible Things™ will befall you. Stories lead gently down the path. They make the lesson obvious without slapping anybody upside the head with it. They have a wonderful way of sticking long after we’ve all gone our respective ways – unlike most traditional lessons, which have a way of evaporating from our brains five seconds after the final exam. Sometimes, stories will even do this miraculous thing where, months or years later, having merely been entertained by it at the moment all that time ago and not having thought of it even once since…you suddenly have a need for that particular story’s lesson. And then, after having hidden silently in the back of your mind for all that time, it surfaces and presents the words, the thoughts, the feelings, the light and scent of fresh air, to lead you out of the darkness. And I frequently do have to bring myself up short in normal day to day conversations, when I catch myself about to launch into some possibly amusing but definitely way too long monologue about said shoemaker’s child (or whatever). And yeah, I’ve even been accused of not being able to make a point without dragging a story into it. But I humbly submit to The Tribe the following: My point was remembered for a long time afterwards by most of the people listening. Checkmate, Mr. Just State The Facts. Check and mate. This weekend vanished with alarming speed, leaving way too much undone. I still haven't gotten the spring transplants started, there are still areas of the house that make me shudder, I haven't even GLANCED at the taxes yet, and furthermore...I got very little knitting done this weekend. MEH. 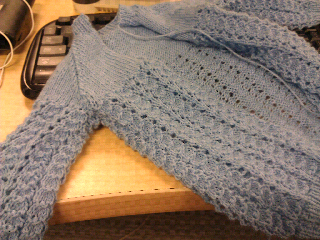 But, I was able to start seaming this little guy on the train this morning. So, things are looking up a bit, huh?! Last night, I mixed up dry ingredients, covered them with a towel, and left them on the counter. And I mixed wet ingredients in a different bowl, snapped the cover on, and left it in the fridge. Then I figured out my delay start function on the oven and went to bed. This morning, I mixed them together, poured them into my jumbo muffin tins, put them in the oven, started coffee, went upstairs and got dressed and GUESS WHAT?! It's like a magic trick! There were lemon yogurt muffins for breakfast! 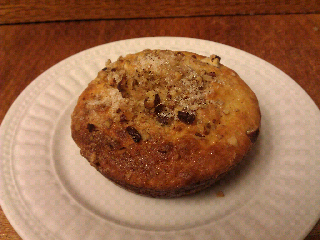 Hot, and topped with their light crunchy nutmeg and pecan topping. Ah, little lemon tree - do you know, CAN YOU KNOW, how much I cherish your fruit...? I went to Costco this weekend. Which I really didn’t want to do, because Weekend + Costco = 12-layer Crazy Cake, but, we were out of eggs, flour and sugar. Let’s be honest here: A lot of us “peek” as shopping carts wheel past us. I too can be fascinated by the choices others make. And sometimes I wonder why somebody buys what they buy. The answer is usually really simple: Because they don’t know there’s an alternative, nor do they WISH to know, so, ZIP IT, CRAZY LADY. But as I was charging around snagging things off the shelves and racing for the finish line, I bumped up against somebody who was stunned to discover that a) #10 cans of tomato sauce existed and b) they were significantly cheaper than the 6-packs of the same exact brand. This week, the #10 can of S&W tomato sauce was $2.49. They also had a 12-pack of the same stuff for $6.99. A #10 can holds 106 ounces, making the cost per ounce about two cents. The 12-pack of 14.5 ounce cans comes to 174 ounces, or four cents per ounce. Which calculations were done on my phone while a fellow mom looked on in wonder. We then discussed the various uses for “that much” tomato sauce, and how to manage what you didn’t use that very day when you opened the can. The idea that you could simply take a few quart-sized Ziploc bags, put 2-4 cups of sauce in each one, lay it flat in the freezer, and have a minimal-footprint supply of frozen spaghetti sauce ready to go…was revolutionary. I had a new best friend. She followed me around the warehouse watching every single thing I put in the cart, and wanting to know how I used it, how I stored it, why this not that, etc. etc. etc. It was a stern reminder for me, actually. I tend to think of a lot of things as “obvious” that really aren’t…until somebody else points them out. Like…yogurt. A lot of us like yogurt, as a snack or in recipes. Did you know it’s super easy to make at home? Seriously. This is all there is to it. Take the yogurt out of the fridge and set it on the counter to move toward room temperature. If you have an electric oven, turn on the oven light; if you have a gas one, the pilot light is probably enough to keep it at around 100 degrees (you can check that with an inexpensive thermometer) (I have two…because I have two malfunctioning ovens, awesome!!). Take four cups of milk, and heat it to scalding (just starting to bubble around the edges, but not outright boiling); let it cool to between 90 and 110 degrees (you can put your [clean!!!] finger in it without yowling). Stir the now-room-temperature yogurt into your cooled milk. Cleanliness is key here – make sure whatever container you’re using is super-clean, because what you’re going to do next is let it ferment for a good six to ten hours in your ~ 100 degree oven…prime temperature for all kinds of things to thrive, yogurt and otherwise. You do not want harmful bacteria to be joining the yogurt’s party! Shorter fermentation results in a less-tangy end product; I usually go with ten full hours, which usually makes for a particularly tangy yogurt. Because I am a wild thing that way. Then, carefully move it from the oven to the fridge – don’t stir, shake or otherwise agitate it! I’ve discovered through trial and error (mostly error) that if I don’t agitate it, I end up with a nice, thick, creamy yogurt. If I can’t resist the temptation to stir (or taste-test) it, I get a runnier version. It’s not bad, exactly, but I prefer the yogurt to resist the spoon a little bit when I’m using it. You can also use a crockpot – preheat it while you’re scalding your milk, then mix the milk and yogurt in the crock, turn the crockpot off, put the lid on and wrap the whole thing in a nice warm towel for the duration. I’ll stir in some fresh or frozen berries, homemade preserves, honey, vanilla or whatever for the ones that are snacks, and leave the rest as it is – set aside about half a cup of it for the next batch and you can be making homemade yogurt for a good long while. When you start getting “runny” or “flavorless” batches, it’s time for new starter…I generally get a good two months of weekly batches out of each $0.50 tub. To me now…that’s so obvious. But I was stunned when it was first pointed out to me a couple years ago that it was that easy to do. Come right down to it, nothing I do is particularly hard, or requires skills only attainable after twenty years of meditation on the Holy Mountain. It’s easy, practical stuff…it just takes time, and curiosity. The ability to laugh off your mistakes helps a lot, as does the ability to look at something from a variety of angles. Which is a deeply satisfying feeling, by the way. Just sayin’. This week’s meals are largely about getting large, bulky things out of my way in the freezer; we’re still down by one freezer and I need to clear some shelves so I can cook breakfasts and lunches ahead again! Also, there is a lot of spinach going on right now. I just harvested thirty POUNDS of the stuff this weekend. Yoinks!!!!! Thursday: Roast Chicken, [hopefully] Blue Nile potatoes [rogue potato plant ready to dig up – here’s hoping it actually has potatoes attached to it! ], more spinach, yay!! "Is that for your grand-baby?" So I hit her with my bifocal case and limped away, dragging my stupid rolling bag that I have to use because I can't seem to manage carrying a backpack like a twenty-something anymore without setting off my hip something FIERCE and could somebody please just KILL ME NOW...? Oh well. It's still a cute little sweater, isn't it? And if I were actually expecting a grand-baby, I would totally make one for him, too. Bet you didn’t know that Tuesday is the new Monday. I know. I too am shocked at the things that don’t make the main newscasts in this country. Ahem. Yes. Well. The weekend got away from me a little bit – there’s a Thing at work that was supposed to go into a testing environment, but then the main partner who is forcing us to do all this in the first place was all, “Oh, wait, hang on, we’re not actually ready!” but I had all this code that wasn’t ready to go, but also couldn’t exactly be dropped, and…it was just a weird weekend. Then last night got away from me. And tonight is about to do the same; I had one of those away-from-home-for-sixteen-hours days today. Awesome. Anyway…I didn’t have any Stunning Revelations last week; I think the most interesting thing for me last week was the realization of just how much certain things I never really took into consideration as Particularly Big Deals have impacted our ability to really get our feet under us. Mind you, when placed into a pool of average people – I’m relatively sheltered from a lot of the stuff that has absolutely slammed the general population. For example, I realized this weekend that what I pay for flour has gone up by 23% in about two years time. Which for someone who does as much baking as I do is a pretty frightening figure. That’s right. I’m paying $1.83 more per month for flour. Somebody call the Red Cross! Get this woman some aid, STAT! As line items, they don’t really hit my radar. I’m aware of them, but they don’t hit me in the gut and make me feel sick, you know? Irritated on occasion, granted, but not devastated. But at the same time…milk has gone up 40%. A dozen eggs 43%. A tank of gasoline that used to cost $23 is now $34. The monthly penalty for gas and electricity has gone from $205 to $355 – and not because we’ve suddenly gotten all crazy with our usage, which has actually stayed flat or even dropped over the last four years – and yet never does this result in a lower bill, somehow. Meanwhile, the husband is not only earning less, but handing over far more of his pre-tax-so-at-least-there’s-that income for health insurance. None of which is news. None of which surprises me. I’m (cough-cough) more than slightly aware of even slight fluctuations in the prices of things I buy regularly, and am one of those people who will walk away from darn near anything when it trips my oh-so-sensitive Too Expensive O’Meter. Y’all have no idea how lucky I feel. We’re going to have to keep on working hard and keeping a tight rein on things; there won’t be any big vacations, or new cars, or indulging in iGadgets and maid services. And we’re OK with that. It’s a road we’ve walked before; sometimes because we had to, sometimes because we wanted something that was otherwise beyond our means. We already have a profound sense of why…and it has nothing to do with being punished. It has everything to do with continuing to pursue what we really want, and having a better chance of actually getting it, by letting go of things that don’t really matter to us – things that are just shiny, or cool, or fun, but that we’re going to drop forgotten on the floor in an hour’s time, bored and looking for the next fun thing. I did come away with a couple action items; we are indeed spending too much on pre-fab food, and I also definitely need to quit being lazy about how I categorize things. I suspect an awful lot of stuff is getting dumped into “groceries” that doesn’t belong in there, but I’ve just been too lazy to actually break things out or even think about what I was actually buying – let alone taking the receipt out of my wallet and reviewing it. The other thing I want to do is figure out if there is any way I could pay off at least one of the debts remaining from the Great (Under)Employment Fiasco™ next month. I think it might be possible…but it may require a fairly intense display of tightwad prowess, a healthy dose of Being A Damned Grownup For Once (nooooooooo, not THAT!) and extremely on-top-of-things organizational skills (…uh oh…) because there would be a bit of Financial Alchemy involving shuffling the virtual envelopes containing the savings goals for things like property taxes, annual car insurance premiums and stuff like that in a kind of shell game – all of it to be fully settled as if nothing had ever happened before April 17 when the income tax returns have to be filed and the bill (if any) paid in full. Meals could have gone better last week; early in the week, I charged out to get the necessary ingredients out of the freezer and found the key to it had gone AWOL. I couldn’t find it anywhere. This was what might be called a major setback; you can imagine how frustrated / angry / freaked out I was, with thousands of dollars in food right there in the garage…and me not able to access it!! After having torn the house apart about five times (including a thorough search of the trash cans and every pocket of every pair of pants I could lay my hands on), I thought to look behind the freezer itself; sure enough, somebody (me) had left the key sitting on top of the freezer instead of putting it back in the cupboard, and somebody else, though warned with increasingly foul language not to EVER do so (husband), had come along and shoved mass quantities of boxes, totes and other paraphernalia onto that same freezer top (the chest freezer is proving a real challenge on that front – everything from baskets of clothes to power tools keep being piled up on top of it! ARGH, QUIT IT!!! )…thus knocking the key clean off the freezer and into the spider-webbed darkness behind it. Fortunately, the insanely large-headed and bright-red-haired Power Puff Girl keychain was relatively easy to spot in the garage…this weekend, when I was finally home in daylight hours. This week is turning out to be mostly a “put random ingredients into skillet, heat through, and serve with rice or noodles” kind of deal.